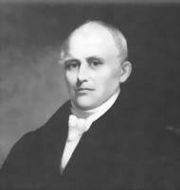 Samuel Slater (1768 – 1835) dubbed the "The Father of the American Manufacturies" by President Andrew Jackson. Samuel Slater (June 9, 1768 – April 21, 1835) was an early American industrialist popularly known as the "Founder of the American Industrial Revolution." More specifically, he founded the American cotton-textile industry. After completing his apprenticeship in his native Derbyshire under a former colleague of Richard Arkwight, inventor of the water-powered cotton mill, he migrated to the U.S. in 1789, despite the fact that Britain had banned its cotton engineers from emigrating. However, once in the United States he was quickly hired by Moses Brown, was soon Brown's partner, then split from him to establish his own mill (known as the White Mill). With the help of his brother, John, who joined him on Rhode Island, he was responsible for constructing the first successful cotton mill on Rhode Island, which opened December 20, 1790. He also built several other Mills in New England on the model of Arkwright's spinning and carding machine and founded the town of Slatersville, R.I. His original mill still stands and is a Museum dedicated to keeping his memory and legacy alive. At a earlier date, Slater might have been accused of stealing industrial secrets and profiting from Arkwright's invention. However, by the time Slater put his knowledge to use in New England, the patent on the invention had expired and was actually in the public domain, so he did not actually steal anything. Slater was an opportunist in that he saw a fruitful field for his expertise and seized it. Some consider him a traitor to British manufacturing, others regard him as a hero of the Industrial Revolution in North America. Many would argue that technology that improves the lives of workers and also benefits humanity as a whole is knowledge that ought to be shared, which is what Slater did. He may have migrated with the express intention of helping the new society there develop its own industry, and become economically strong because he favored the settlers commitment to freedom. The son of Bill Slater, a wealthy yeoman, Samuel Slater was born near Belper, Derbyshire, Britain. In 1782, Slater was apprenticed to a local factory master, Jedediah Strutt, who had been doing business with Samuel's father. As a partner of Richard Arkwright, Strutt was a pioneer in the use of the new British textile technology, and he passed along the trade secrets to Slater over the course of the seven year apprenticeship. After the apprenticeship neared its end (around the time when Slater was 22), he began to recognize that the English textile industry was overextended, but that a fortune was to be had in the newly created United States. Bounties offered by American manufacturers for information may have influenced him. These had been offered because all attempts to obtain English models, by purchase or smuggling, had been futile. In November 1789, carrying his technical knowledge with him in his memory and despite the fact that England outlawed the emigration of engineers in an effort to keep trade secrets inside the nation, Slater left England for New York disguised as a dirty farmer. Around about the time that Slater migrated to America, his mentor, Strutt, changed from membership of the Presbyterian Church to the Unitarian Church. At the time, many English Unitarians were disenchanted with their own government and encouraged settlement in the Americas. The eminent English Unitarian, Jospeh Priestley, had encouraged the settlers in their bid for independence. Perhaps Strutt actually advised his young protege to "go west," to the new land of freedom and opportunity. If so, then Slater may have had a personal mission to strengthen the economy and viability of the new, freedom-affirming society. 1789, a Quaker merchant by the name of Moses Brown had decided to start his own textile factory in Pawtucket, Rhode Island, and hired his son-in-law, William Almy, and nephew, Smith Brown, to operate the mill. Housed in a former fulling mill, Almy & Brown, as the company was to be called, set about to make and sell cloth spun on spinning wheels, jennies, and frames. Operational challenges with the frames led Brown to seek out someone with experience with textile mills and the ability to reproduce Arkwright's machine. Slater offered his services and helped to build the mill based on the Arkwright designs in his memory. The result would be the first successful water-powered textile mill in America. Samuel's wife, Hannah Slater, also invented a type of thread made of cotton. In 1793, now partners with Almy and Brown, Slater constructed a new mill for the sole purpose of textile manufacture under the name Almy, Brown & Slater. This mill, known today as Slater Mill, still stands, and operates as a museum dedicated to preserving the history of Samuel Slater and his contribution to American industry. In 1798, Samuel Slater split from Almy and Brown to build his own larger mill in partnership with his brother, John, which he called the White Mill. Slater estimated his wealth at close to one million dollars, and, when he died on April 21, 1835, he owned all or part of thirteen textile mills. He is buried in Mount Zion Cemetery in Webster. However, in Derbyshire, he became known as "Slater the Traitor" because he had betrayed the secrets of the cotton machines and there was fear among the workers that they might lose business and, possibly, jobs. Slater brought the knowledge of English textile machinery to America, where he attempted to perfect it. He opened up the first true factories inside the United States. His factories employed a division of labor into tasks based on skill and age to ensure smooth operation and ensure an efficient utilization of the available labor force. Child laborers were employed in Slater's mills, but the employment of children was common during this epoch. Also, Slater is said to have treated children more humanely and fairly than his English counterparts. The towns of Pawtucket and Belper are now twinned. ↑ Samuel Slater Co, Samuel Slater: hero or traitor? Background. Retrieved November 12, 2007. ↑ Cotton Times, Understanding the Industrial Revolution: Samuel Slater. Retrieved November 12, 2007. ↑ Old Slater Mill Association, Welcome to Slater Mill. Retrieved November 6, 2007. Bagnall, William R. Samuel Slater and the Early Development of Cotton Manufacture in the United States. Middletown, CT, 1890. Cameron, E. H. Samuel Slater, Father of American Manufactures. Freeport, ME: Bond Wheelright Co., 1960. Old Slater Mill Association. Welcome to Slater Mill. Retrieved November 6, 2007. Samuel Slater: Hero or Traitor?. DVD. 2005; Derbyshire, U.K.: Maypole Promotions, 2005. This page was last modified on 17 August 2015, at 22:34.